After about half a month of preparing for moving, working on a few odd jobs, and getting school in order, I can finally come back and hack out a post on here. Well, thanks for holding down the fort Drew. Life has kind of been a bugger for me lately, though I should be thankful it is still better than many. Please keep your prayers and thoughts with Peiper and his wife. I know there are dozens of things happening in the wider world for me to talk about, but right now it’s the start of a new week and I just want to catch my breath, kick back, and Relaaaax! So when I sat down I realized I wanted to make a post about something I enjoy doing in my off time, and which some of you might be able to enjoy doing as well. But which is still at least a little bit topical to the hell-in-a-handbasket way of the real world. 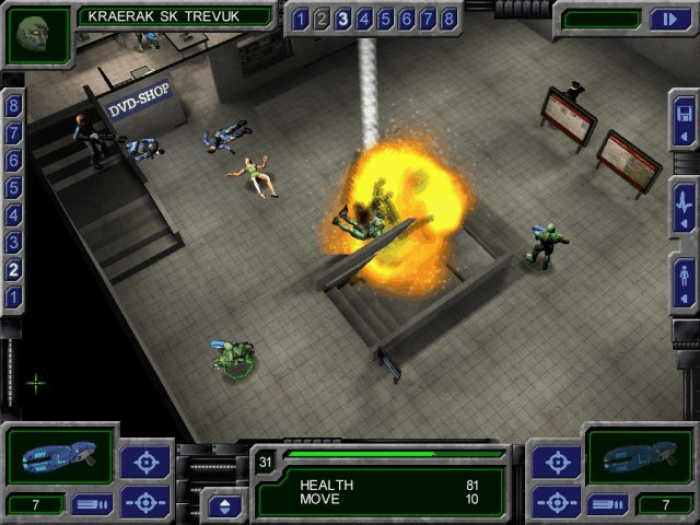 Ok, more specifically the explosions- and everything else- in a little thing called UFO: Alien Invasion. Some of you might have heard of it before, some of you might have played it before. But I figure that there are probably at least a few other videogamers out here who would enjoy it, and that in a time like this at least a few people who aren’t that would be able to appreciate it..
I’d probably have to rate this game as one of the real gems you can find online if you like strategy and tactics. It isn’t the newest thing in the batch and it doesn’t look like a modern Triple A title- though I do think it looks good in its’ old way, and the globe is breathtaking. (Yes, this is what it really looks like in gameplay.. and this still doesn’t really do it justice compared to how it Moves.). But what really makes it sparkle is the sheer *Depth. 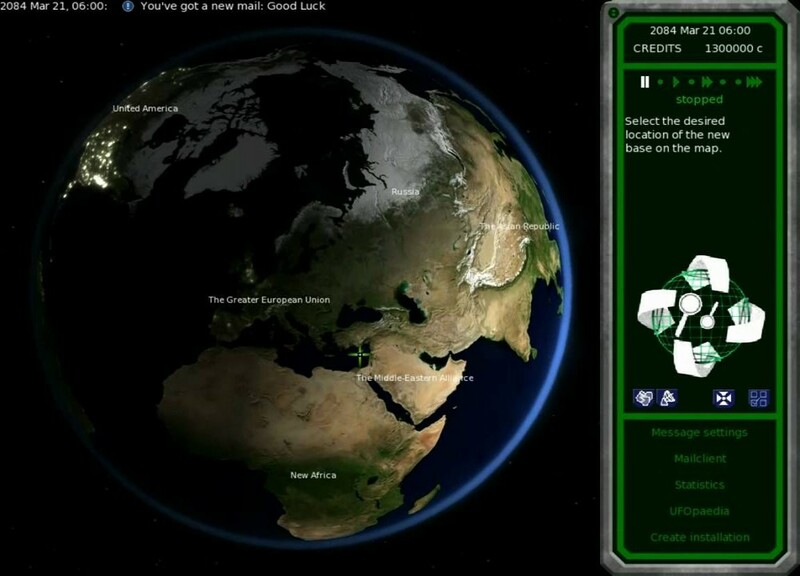 * There is an awful lot of depth to the game, from being on the worldview map deciding where to place bases like you’re a command in chief pointing at a map, taking emails, and tracking allied and friendly aircraft. To being down on a base managing what it researches or builds, to probably the heart of the game: meeting the enemy on the ground, where your squad and theirs fights it out for the future of a world one turn at a time. All the while trying to keep your coalition above water and close the tech gap. The storytelling is also pretty good. The backstory lore is… probably average to above average, with the world of 2083 being a rather peaceful, idyllic place where super-nations and federations live in relative peace and increasing prosperity and freedom, even for places like the Middle East. The actual backstory I’d say is hit and miss with a few liberal buzzwords thrown around but nothing that offensive (unless you figure working with the UN is offensive in and of itself.... and by the off chance you DON’T playing politics with your funding nations will swiftly change your mind). On the whole I’d probably say there are some things that come across as incredibly optimistic or off tone, but others that sound incredibly prescient (like what happened to the US because of reckless deficit spending and China’s totalitarian expansionism before it fell). But I’d probably say that it comes across mostly like they wanted to establish one big happy world to juxtapose it against the coming darkness. But the actual story over the game is quite good and (from what I’ve been told and can figure out) relatively scientifically sound (or “hard") as far as Sci-Fi goes. Don’t expect the enemy to let you get complacent, because there will be a lot of twists and turns before the end, and it’s obviously where most of the lore attention and juicy technological red meat went into. And wisely so! So, I’d highly suggest you give it a try, for something that *might* have you coming back a lot. Now, I’ve tries to explain why I like this. But what makes it topical? Well, this game- and ones like it- is probably one of the great anti-terrorist epics in recent game history. Yeah, you heard me right. Because while the enemy are aliens and the game is set in a relatively utopian world (again, including the MENA, Africa, and Asia...), the means and messages are far more down to Earth than Angela Merkel is. You see, the enemy you face are terrorists in how they act and behave, they just happen to be aliens terrorizing the Human Race. You’re going to be facing an enemy that will spend much of its’ time dropping violent squads in cities, indiscriminately murdering whoever they can before trying to get out just as suddenly as they struck. Trying to identify and pre-empt these attacks and strike at the heart of those waging murderous war on you is the heart of the game. And it will not be an easy one, because this will be a rather long war and all the while you will have to keep a weak kneed public and their politicians from losing their cool and simply surrendering to the terror, and yourself from being wiped out by attrition against an enemy that seems to have no trouble replacing its’ cannonfodder. In a way, it’s a chance to spend some hours away in the kind of position that you might dream of. Or have nightmares of. The chance to lead a combined, international fight to understand and destroy an enemy that endangers everyone and seeks to shape the world in its’ image. To make the calls and avoid the mistakes that Merkel/Obummer/InsertNameHere has. But at the same time that means that you will have nobody to blame more for defeat than yourself. 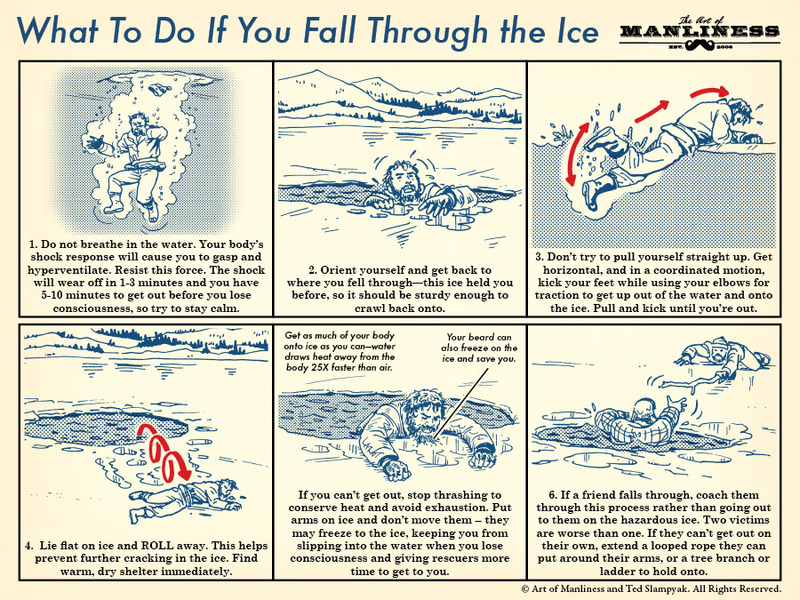 So you are out on the frozen pond, lake or river—maybe ice fishing, ice skating, or whatever you do on ice. You fall through the ice into the freezing water. What do you do? Somebody on my Facebook page posted what to do in that very dangerous situation. I don’t normally grab an article from the papers with nothing to say about what I post. But there are exceptions and this is surely one. Not only that, but one you will enjoy seeing. Be sure to click the link for all of the pix. Here’s what happened. This guy tried to rob a couple of ladies at an ATM. Here in the UK they are called cash points or hole in the walls. 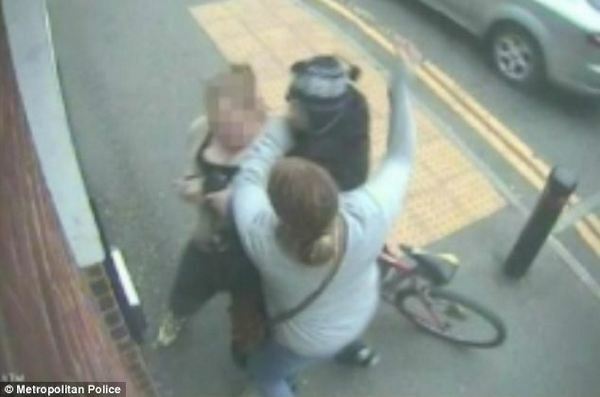 A thief told the mother of two sisters who beat him up when he tried to rob them at a cash machine that they needed to ‘learn some manners’. The would-be victims punched the man in the face and dragged him off his bike when he tried to grab their cash from an ATM. But the thief then cycled up to their mother to berate the sisters for not having ‘manners’. Immediately the two sisters, aged 25 and 27, realise what he is trying to do and one punches him in the face. The same woman then grabs him around the neck with both arms and puts him in a head lock. After freeing himself, the man spits at the women as they walk away so one of the sisters promptly turns around and pulls him off his bike. 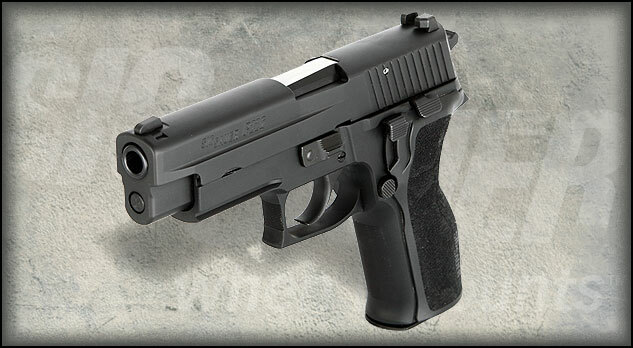 The SIG SAUER® P226® is the pistol that set the standard by which all other combat handguns are measured. Designed as SIG’s entrant in the military trials to replace the 1911, today the P226 is in use by the U.S. Navy SEALs, Federal agents, and numerous law enforcement agencies including the Texas Rangers, Ohio State Highway Patrol and the Michigan State Police to name a few. 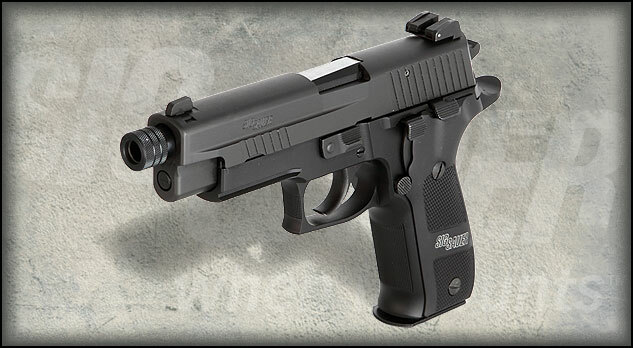 The exceptional ergonomics and balance make this full-size pistol easy to handle. Available in either 9mm, .357 SIG or .40 S&W, its longer barrel yields better ballistic performance and accuracy. Note the old-style grips and the white lettering that was discontinued do to popular complaining. As I said, I don’t have the beavertail. The threaded barrel is for the optional suppressor, which I shall buy later. There’s a $200 gov’t fee, a 9-month wait, and that’s in addition to the suppressor price. I daresay I’d get on all sorts of gov’t watch lists, but as a vet, I’m already on all sorts of gov’t watch lists. 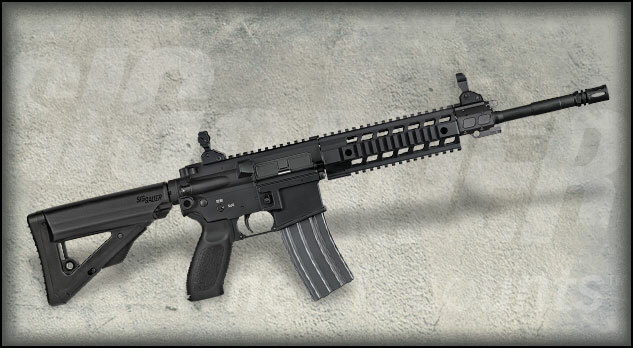 In lieu of that, I’m thinking of a SIG516. If I buy it from the same dealer, I don’t have to do the background check again since I just did it today and the paperwork is still good. Is that the gun show loophole? Obviously if I buy from another dealer I have to do the check again so the new dealer has paperwork. The following is pretty long as you might expect. So I’ve cut it down and you can read all of it at the link as usual. This comes from what’s left of The Conservative voice in Europe. It’s very much worth reading and of course a lot has been said already on the topic. I wish there were a way to rid ourselves by any means, of the enablers, the liberal left hand wringers who have brought us to this pass. 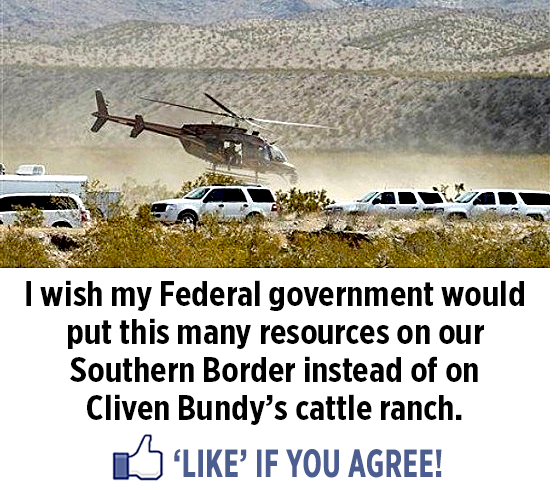 But then, I can’t think of many people, even conservatives, who’d approve my solution. Because it would be a very final one. And frankly, I see no other way. If there is one, hey. I’m open to learning new things. A few hours ago, Geert Wilders spoke at the Western Conservative Summit in Denver, Colorado. What follows is the complete transcript of his speech. Thank you, dear friends, ladies and gentlemen, for inviting me to the Western Conservative Summit. It is always a pleasure to come to America. I was here a few weeks ago to meet with my dear friend, congresswoman Michele Bachmann, to talk about Islam and the threat to America and Europe. It is also a pleasure to be in Denver, the gateway to the West. This is America’s conservative heartland where the spirit of the pioneers still lives. I know that I come at a sad moment. Many of you have been affected by the enormous wildfires raging not far from here. Thousands have been evacuated and some of them are even staying in this hotel. Few things are as terrible as losing your homes. I want to express my deepest sympathy with all the people affected by this disaster. And I want to offer my condolences to the families of those who lost their lives in the fires. I am impressed by the solidarity and the help which the people of Denver extend to the victims. You live in a great and generous city. Denver is also privileged to be the home of Colorado Christian University and the Centennial Institute with its motto “Faith, family and freedom”. Your motto shows that you have your priorities right. Faith, family and freedom are the pillars of our Judeo-Christian civilization and need to be defended. But first, let me start by introducing myself. I am one of the 150 members of the House of Representatives in the Netherlands, a small country of almost 17 million people in Western Europe. I am the leader of the Party for Freedom. My party is the third largest of eleven parties represented in the Dutch parliament. Perhaps many of you think that life for this politician in the Netherlands resembles the life of the members of your own Congress. Unfortunately, that is not the case. For the past eight years I have been living under 24 hour police protection. Wherever I go, plainclothes policemen go with me. I live in a government safe house, heavily protected and bulletproof. I am driven every day from the safe house to the Dutch parliament in armored police cars with flashing blue lights. I have not walked the streets on my own in the past eight years. When I occasionally go to a restaurant or a movie theater, the police will have to check everything first. My wife and I have lived in army barracks and prisons cells just to be safe from assassins. Why do I need this protection? 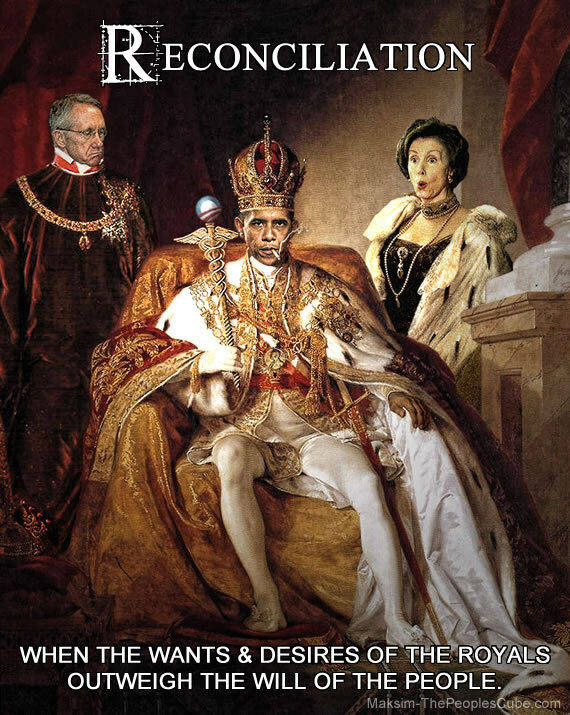 I am not a president or a king; I am a mere parliamentarian. I have, however, been marked for death for criticizing Islam. I was placed under police protection in early November 2004 when an Islamic fanatic murdered th Dutch filmmaker Theo van Gogh because he had criticized Islam. Van Gogh was slaughtered in broad daylight in the streets of Amsterdam. A few hours later, the police found a letter written by the assassin threatening to kill me as well. What have I done, you might ask, to deserve those death threats? I have candidly expressed my views about Islam. My views, in a nutshell, are that Islam, rather than a religion, is predominantly a totalitarian ideology striving for world dominance. I believe that Islam and freedom are incompatible. Some people do not want to hear this message. That is why they threaten to murder everyone who states this truth. I do not want Europe nor America to become Islamic. There is only one Islam and it is a dangerous ideology. It is intolerant, it is violent. It should not be tolerated, but should be contained. In Europe, we are experiencing that if Islam becomes stronger in a society – even when the majority of Muslims are moderates – a society becomes less free and more intolerant of non- Muslims. Former congressman Tom Tancredo, a native and inhabitant of this great city, whom I visited in his office in Washington in late 2008, once said referring to Miami: I quote “Look at what has happened to Miami. It has become a Third World country. You would never know you’re in the United States of America. You would certainly say you’re in a Third World country.” – end of quote. The same applies to Europe: Certain parts of our inner cities no longer look like Europe. They look like suburbs of Cairo, Rabat, Algiers, Damascus or Mecca. As the Muslim population is concentrated in urban areas, many European cities have very large Islamic concentrations. We are confronted with headscarves and burkas, polygamy, female genital mutilation, honor-killings. During the past three decades, Europe made a fatal mistake. It allowed millions of people from Islamic countries to immigrate into Europe. So many people rooted in a culture entirely different from our own Judeo-Christian and humanist tradition have entered Europe that our heritage, our freedoms, our prosperity and our culture are in danger. Perhaps, many Americans still believe that Europe is the place they know from a tourist trip or from their grandparents’ stories. This Europe is on the verge of disappearing. “In each one of our cities” wrote the Italian author Oriana Fallaci shortly before her death in 2006, “there is a second city, a state within the state, a government within the government. A Muslim city, a city ruled by the Koran.” – End of quote. Perhaps many Americans see immigration as something which is inherently good for a country, since it contributed so much to the United States. But while most of the former immigrants to the United States came from Europe, a continent with the same Judeo-Christian roots as America, Europe’s contemporary immigrants do not share our common roots. On the contrary, the islamization of our society is undermining our Western Judeo-Christian values. Sounds like a Heinlein novel. He actually wrote one titled ‘Revolt in 2100’. Guess we’re 90 years early. Courtesy of Old Catman in the comments. Democrat heads will roll! 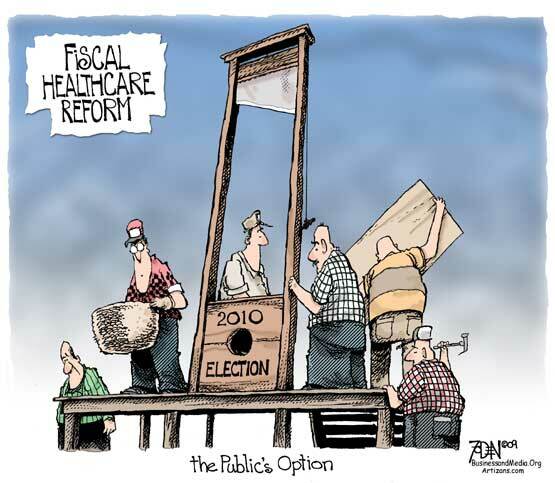 Public executions! I’ll be running the hot dog/popcorn stand. Don’t even ask me how I stumbled over this one. You gotta love the *BYOB. Don’t forget the ‘overbust’ version, which comes in straighline or sweetheart cut. Well here we are again. Ain’t this fun? This has to be happening in the USA as well. No? Yes? I’d have thought after the last time this might not have happened so soon. And this guy didn’t even beat anyone up. He foiled a robbery of his place. He gets arrested. I didn’t post the whole article but it is a MUST read. Stupid never ends. When a restaurant owner found two teenage yobs raiding his beer cellar, he chased them and held them while his staff dialled 999. Sal Miah assumed police would commend him for catching the young criminals. But when officers arrived, they arrested 35-year-old Mr Miah on suspicion of assault and battery. ‘The system is a joke. How can a man who tries to prevent a crime in progress end up being the criminal? ‘People are living in fear of these kind of yobs but when you do take a stand and try and defend your home or your business you end up in trouble. It would be a cool idea to read this with Loony Tune closing theme in background. Cos that will help you get a grip while reading this nonsense. Here I thought I was gonna get to my first coffee this morning, but when I saw the headline, I headed for the computer instead of the kitchen. Myleene Klass, the broadcaster and model, brandished a knife at youths who broke into her garden – but has been warned by police that she may have acted illegally. Miss Klass, a model for Marks & Spencer and a former singer with the pop group Hear’Say, was in her kitchen in the early hours of Friday when she saw two teenagers behaving suspiciously in her garden. The youths approached the kitchen window, before attempting to break into her garden shed, prompting Miss Klass to wave a kitchen knife to scare them away. Miss Klass, 31, who was alone in her house in Potters Bar, Herts, with her two-year-old daughter, Ava, called the police. When they arrived at her house they informed her that she should not have used a knife to scare off the youths because carrying an “offensive weapon” – even in her own home – was illegal. Jonathan Shalit, Miss Klass’s agent, said that had been “shaken and utterly terrified” by the incident and was stepping up security at the house she shares with her fiancé, Graham Quinn, who was away on business at the time. He said: “Myleene was aghast when she was told that the law did not allow her to defend herself in her own home. All she did was scream loudly and wave the knife to try and frighten them off. “She is not looking to be a vigilante, and has the utmost respect for the law, but when the police explained to her that even if you’re at home alone and you have an intruder, you are not allowed to protect yourself, she was bemused. The Sunday Telegraph’s Right to Defend Yourself campaign is seeking a change in the law to provide greater rights and immunity from prosecution for householders in dealing with intruders. A spokesman for Hertfordshire Police said: “We got a call at 12.45am on Saturday to reports of the owner of the property hearing noises outside their address. “Officers were in attendance and checked the property. “There was no one around although they could see footprints in the snow. No property had been taken and there were no intruders. It was treated as a trespass incident. Passwords are a pain in the tail. But they have become an aspect of our everyday lives. Use your ATM card at the store, enter your PIN. That’s a password. Access your bank account online, enter a password. Log onto BMEWS to make a comment, enter your password. You can’t get away from them. Lots of people use short, simple passwords that are meaningful to them and easy to remember. Birthdays, Social Security Numbers, favorite colors, the name of your secret fantasy movie star. And these are all very unsecure and easy to crack, especially by anyone who knows a bit about you. Sarah Palin had her email hacked during the ‘08 campaign. She had an account on Yahoo, and somebody was able to reset her password by properly guessing the clues that Yahoo asked for in their “I forgot my password” area. Most places have that kind of area, and most of them use pretty common questions, which defeats the whole concept of passwords. Some banks and credit card companies have come up with a few new questions since then. It’s a small help, but only a small one. Lots of people use just a couple of passwords for almost everything. I know I do. Trying to remember the 70 or so passwords I need to log onto various forums, blogs, my accounts at any number of business pages, etc., is impossible. Sure, I could write them all down. Or I could let Windows “remember” them for me. Not a chance, no thanks. And even if I did write them down, I’d hide the list somewhere smarter than the underside of my keyboard or taped to the back of the monitor. Duh. I do not let my computer store anything about anything, not even browser history, cookies, Most Recently Used lists, nada. I am forever stripping information out of my PC by using CCleaner, MRUBlaster, and RegCure daily. I have an old co-ax A/B switch on the back of my computer, so that when I am not online I can physically disconnect my computer from the internet. I only do online business with places that don’t store my credit card information. Any bills that I throw out go through the bi-directional shredder. And I check my credit rating and my Social Security a couple times a year, just to keep an eye on things. So far, I have never had any kind of problems, but hacking and identity theft happen. You have to be aware, and you have to act smart. I have one “don’t care” password I use for all the blogs and web sites I need to log on to. It’s of reasonable length, and has nothing to do with any aspect of my life. I use serious, unique passwords for all my credit card and banking sites, and my private email. And I change those at least twice a year. I don’t pay for any credit card “protection”, but I do have credit cards with companies that will alert me if something unusual occurs. It turns out that most people don’t do anything as “extreme”. Most folks still use passwords that are short, simple, and easily guessed by people who know them even a little. Bad form. By the way, I can not read your passwords here. Even though I own this blog and have access to everything right down to the database tables and the blog template source code, I can not read your member password. I can reset it if necessary, but I can’t see it. So, what to do? Try making a smarter password. Add numbers, spaces, and special characters if you can. Then run the new password past the Microsoft password strength checker (there are others too) to see if it scores at least a “medium”. And figure out a “best” password for each online credit card and bank account that you access. Passwords not to use? Here is a list of the 500 lamest ones. “abc123”. “password”. “letmein”. Oh come on, you have to do better than that these days! You want a good password? Are you a car junkie, or a gun nut? “454 Ch3vy R0cks!” meets all the criteria for a “best” rating. It even has a tiny bit of “leet” in it, which can help. (substituting 4 for A, 3 for E, 1 for I, 0 for O adds a lot to password strength. Many places do not let you use spaces or special characters) Another strong one is “Marlin 336 .30-30”. And they are especially good if you don’t have one of either. “I Love Lucy” only rates a “medium”, and it isn’t on that list of 500, but if people know that’s your favorite TV show, then it’s a poor choice. So be smart. Just in case. A bit of a false start but back with wascally Texas wabbit just for laffs. I got this in a newsletter today and find it’s actually a year old. Since this is the first time I’ve seen it, I thought it could be yours as well. Just something different for this one moment in time.